Pebble Limited Partnership (PLP) is responsible for exploring and advancing the production of one of the world’s largest scale copper, gold and molybdenum mines in a remote region of southwestern Alaska. Here is how we use Laserfiche integrated with Microsoft Great Plains to make our accounts payable process nearly paperless. 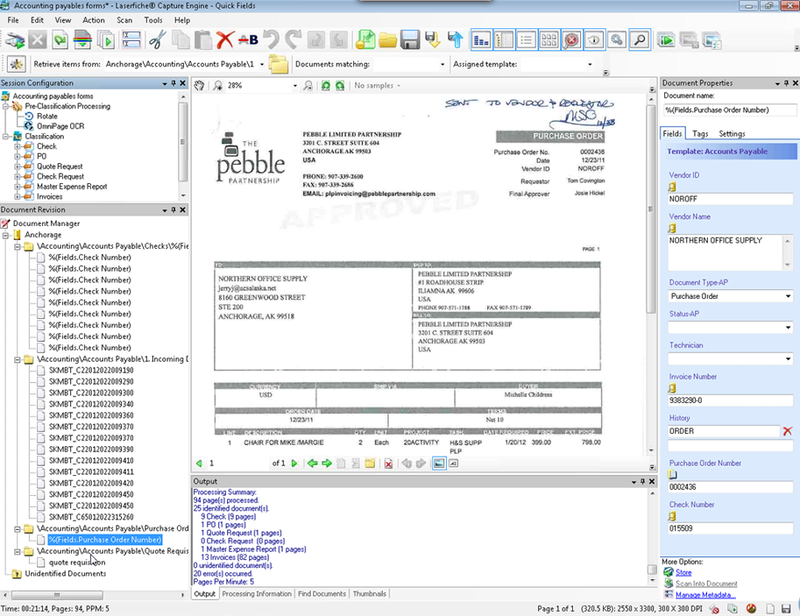 Paper documents are scanned to the “Accounting Scans” folder on the network. From there, Laserfiche Import Agent imports them into the “Incoming Documents” folder in the Laserfiche repository. 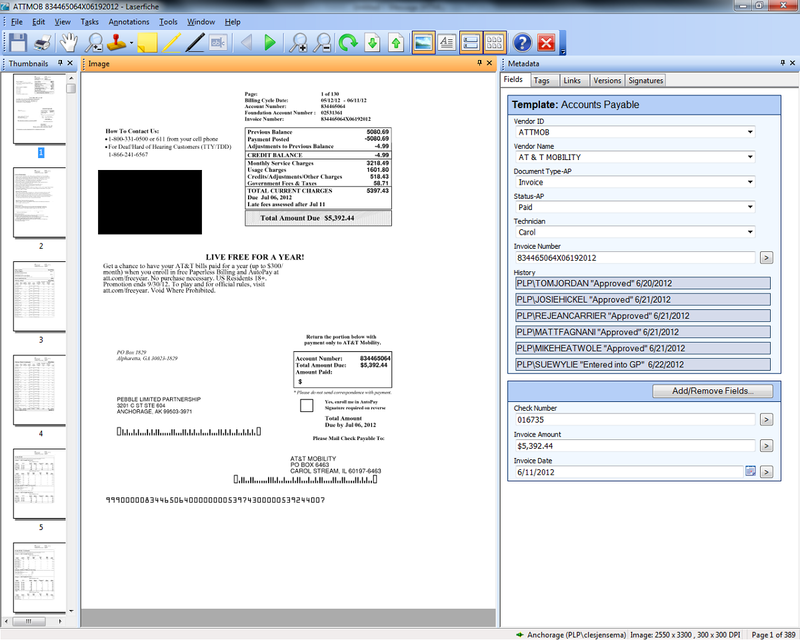 Electronic documents are printed directly into the “Incoming Documents” folder with Laserfiche Snapshot. Laserfiche Quick Fields Agent runs a scheduled Quick Fields session nightly to sweep the “Incoming Documents” folder and identify document types, assign templates and populate fields. AP techs check all the documents in the morning to make sure that all of the fields have been populated correctly before sending them to the “Invoice Materials Ready for Techs” folder in Laserfiche. AP techs look through the invoices in the “Invoice Materials Ready for Techs” folder and select the invoices for which they are responsible by updating the value of the “Technician” field. 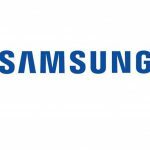 Each tech has particular invoices that she is always responsible for but it is very easy to reassign invoices if workloads need to be modified. Laserfiche Workflow then changes the invoice’s status to “Awaiting Materials” by updating the “Status – AP” field and routes the invoice to the assigned tech’s “bucket” folder. 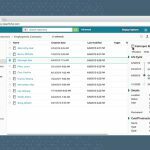 Combine the backup materials such as packing slips or vendor quotes and merge them with the invoice. Add a coding sheet to the last page. A coding sheet is an Excel spreadsheet that is imported to the tech’s “bucket” folder in the repository using Laserfiche Snapshot. It is then merged with the invoice. Populate the “Vendor ID” and “Invoice Number” fields. Assign the reviewers, approvers and executives by adding the required fields and updating their values. Since only invoices with a very large dollar amount are required to be reviewed by executives, that field may sometimes be set to “Not Needed”. Once these tasks have been completed, the AP tech changes the status to “Ready for Review” and closes the invoice. Laserfiche Workflow routes the original invoice to the “Routing Payables” folder and creates a shortcut in the “Approval Actions\Employee” folders. It also sends an e-mail notifying the reviewer that there is an invoice pending review. The e-mail includes a link to the invoice and a link to the employee’s “Approval” folder (in case they want to access multiple invoices immediately), along with a Laserfiche Web Access link, which the reviewer can use to open the invoice remotely if they are not in the office. Multiple reviewers can review the invoice simultaneously. 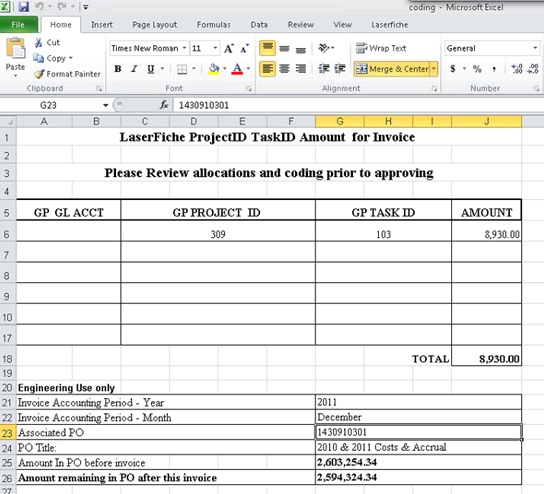 After review, Laserfiche Workflow routes the invoice on to the approvers. After each status update, Laserfiche Workflow populates the “History” multi-value field with the action performed, the username of the person making the change and the date. This allows the approvers to see exactly what has happened to the invoice thus far. Once the approvers have reviewed the invoice, it goes to the executives for approval, if needed. Multiple executives can review and act on the invoice at the same time. Place a sticky note on the invoice to indicate the changes needed. 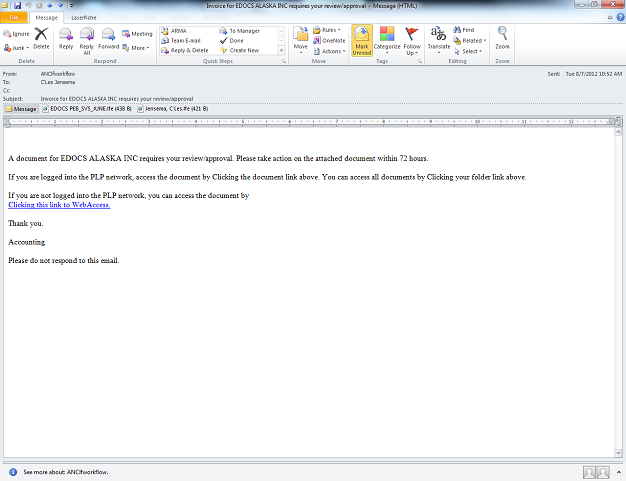 Laserfiche Workflow then sends the invoice back to the initial AP tech with an e-mail notification. Reviewers, approvers and executives have 72 hours to review the invoice. If no action is performed within that timeframe, the accounting manager is notified by e-mail. She can either send an e-mail reminder to the individual in question to spur action or notify the AP tech to create an emergency routing straight to an executive. Fully approved invoices are automatically stored in the “Not yet in GP” folder with an updated status of “Approved for Payment”. AP techs prepare the invoice for payment by entering the information directly into the Microsoft Great Plains accounting system. Once the information is in Great Plains, the techs update the invoice status to “Entered into GP” which spurs Laserfiche Workflow to move the invoices to the “Entered into GP” folder. 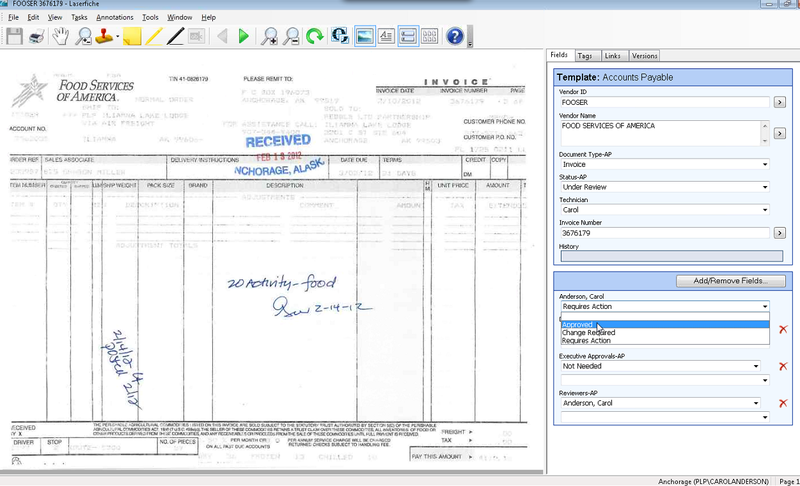 Once checks are generated and printed from Great Plains, they are scanned into the “Incoming Documents” folder in Laserfiche. Laserfiche Quick Fields is then launched to add a template to each check, read the check number and perform a lookup into the Great Plains database to populate the remaining fields: “Check Amount”, “Date”, “Vendor ID” and “Related Invoices”. An AP tech performs a quality check on the checks then sends them to a records management folder for storage. Then, Laserfiche Workflow automatically generates shortcuts in the “Checks” folder for user reference. The invoice’s status is changed to “Paid” and the invoice is stored in the “Accounting” records management folder. 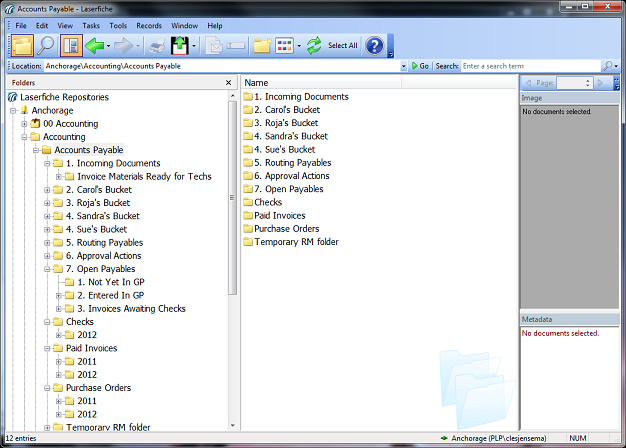 Shortcuts are generated in the “Paid Invoices\Vendor” folders for easy access. 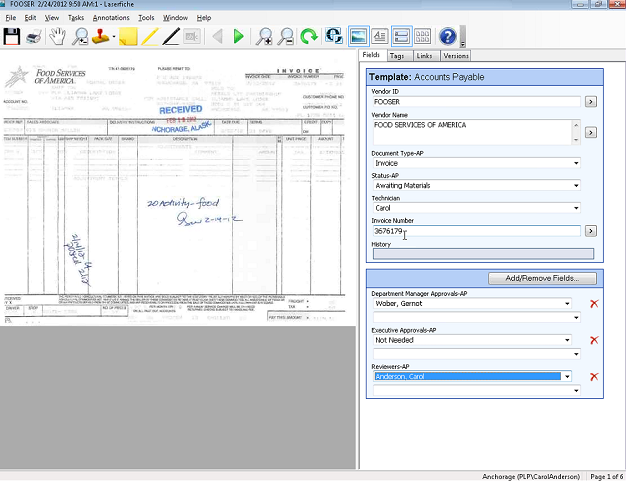 The Accounting Manager searches for paper checks to be signed by the check number using the “Field Search” in Laserfiche. She verifies the check amount against the invoice. These checks are sent to executives for signatures and are subsequently returned to the AP techs to be mailed. A savings of $8,300 per year just on postage, paper and storage costs. 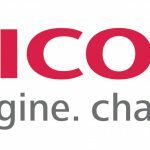 97% of all invoices are now received electronically and never printed. Invoices are processed much faster. Before Laserfiche, a telephone invoice took fourteen days to process. Now it takes only two. Employees can access Laserfiche easily from any location, even the remote mine site. Accounting managers can easily monitor invoice activity. Data errors have decreased as everything is easily looked up from Great Plains. Approvals occur in a timely matter. If no action is performed on an invoice in three days, the appropriate people are notified and certain steps can be bypassed if needed.